to commemorate the Coronation of the new King George VI and his wife Queen Elizabeth. To Commemorate the Coronation. May 12th 1937. Below is another medal, this time with the original ribbon and fastener. Three thousand six hundred medals were to be distributed to Matlock and District's schoolchildren. Unfortunately, the inclusion of the Council Chairman's name on the medal was not approved of by all. Matlock Bath residents met in the Grand Pavilion to protest, sending a letter to Matlock Urban Council. Bonsall, Cromford and South Darley Coronation Committees also wrote to the Town Clerk whilst North Darley complained that the inscription had been decided before Mr. Wildgoose had been elected Chairman. 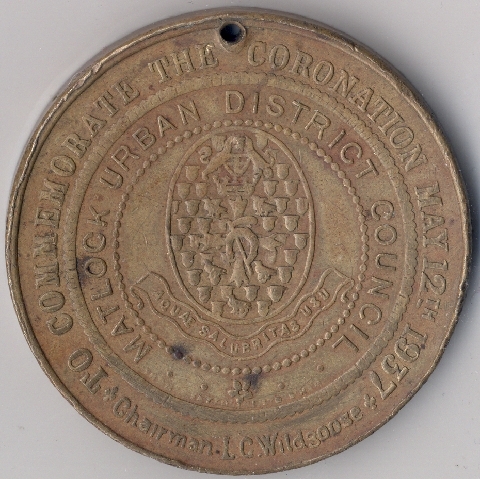 However, it emerged at a special meeting of the Council that Mr. Wildgoose himself had initially objected to his name being on the sample medal he'd seen, but the rest of the Council had decided his name should be on it. The medals had all been cast before the objections were received. Matlock Council stated that they deeply regretted the criticism but the design had been a unanimous decision. Larger images provided by and © a private collector. Smaller picture © Bernard Gale collection. Researched by and © Ann Andrews. Intended for personal use only. 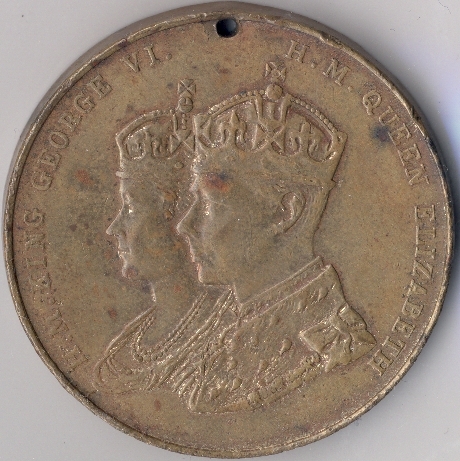 The actual size is 1½" (3.8cm) diameter, the medal weighs about the same as a crown and looks like the same as an old penny. George VI became King following the Abdication of his brother Edward, later Duke of Windsor. George VI reigned until his death, at Sandringham, on 6th Feb 1952. Queen Elizabeth (the Queen Mother) died 30 March 2002, aged 101. She was formerly Lady Elizabeth Bowes-Lyon. The couple married in 1923. Lubin George Wildgoose was Chairman of Matlock Urban District Council between 1932 and 1938. "Derby Daily Telegraph", 28 April 1937. "Derby Daily Telegraph", 24 April 1937. "Derby Daily Telegraph", 30 April 1937.